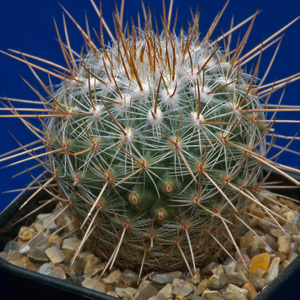 Many cacti and succulents are undemanding and easy to grow, but like any plants they are not indestructible, nor are they immune to pests and diseases. Some of the more common problems are described here along with advice regarding actions which can be taken to help avoid and minimise the effects of them. Any plant that looks unwell, perhaps excessively soft or lacking its normal healthy sheen should be investigated promptly. Delay could result in the loss of all or part of the plant, and could result in the problem becoming more widespread throughout the entire collection. Most problems fall into three main categories : physical damage, pests and diseases. Plants grown in poor light will suffer from thin and/or pale growth and weak spination. Ensure the plant gets sufficient light. The initial symptom for a plant that has lost its root is shrivelling due to a lack of water and nourishment. Unfortunately exactly the same symptom can be the result of underwatering where the application of more water would solve the problem. This simple remedy would however have fatal consequences for a plant already without roots. Examine the plant to see if the compost is wet. Even if it is dry there could still be root damage and so it should be removed from the pot for a closer look. If it is found to have problems damaged roots should be cut away and the cut surfaces treated with fungicide powder and it should be treated as a cutting. Do you have a good quality picture of this problem? If so we would be interested in being given the opportunity to use it. Despite often coming from hot parts of the world, many succulent plants obtain shelter in their natural habitat by growing in the shade of rocks, trees, etc. Plants in cultivation that are subject to sunlight through glass can easily become scorched. Provide plenty of air movement and adequate ventilation. 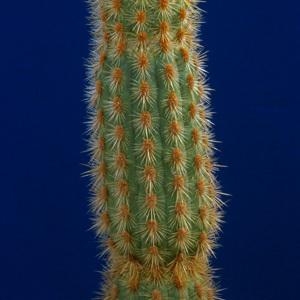 As cacti absorb moisture their bodies swell and become taut. This tension in the skin can result the plant literally tearing itself apart. 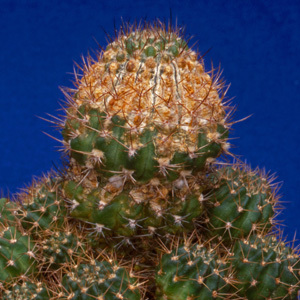 Turbinicarpus and Lophophora are particularly prone to this problem. There is no cure, though eventually a split plant may shrug the damage down towards its base but it will certainly remain unsightly for a long time. The risk can be minimised by gradually increasing the amount of water given reduced quantities of water for the first couple after the plant's winter rest. Problem - "Stopping" and "Die-Back"
Plants die back from their tips, or stop growing for a time eventually starting again leaving an unsightly "neck" around the plant body. Both these conditions usually result from too deep a dormancy. Die-back can also be the reult of insufficient water during the growing season. Ensure plants are in good condition and growing well before they are given their winter rest. Keep plants growing evenly during the growing season. Mistreatment or rough handling will inevitably cause damage. Take care to avoid bruising or tearing plants when handling them. Avoid touching the surface of succulents that have a powdery farinose coating on the leaves as this is easily rubbed off. 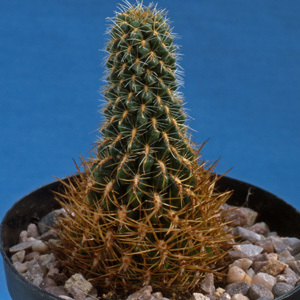 When repotting cacti handle them gently to avoid pulling off spine clusters - particularly if wearing gloves, and if the plant has hook shaped spines. Such treatment will not prevent infestations, but it should reduce their frequency considerably. A further precaution is to give the entire collection an occasional application of insecticide. These small, oval shaped pests grow to about 0.5cm (0.2") in length and are by far the most common insects to infest succulent collections. Their white waxy covering helps protects them from water-based insecticides. Their presence can be detected from the fluffy white deposits they leave on the plants. Systemic insecticide. They can also be controlled - but not eradicated - by means of predatory insects. Small infestations can be treated by touching them individually with a paintbrush dipped in methylated spirits, but this is again unlikely to eradicate them completely. A similar pest to Mealy Bugs, Root Mealy Bugs attack the plant's root systems, often without being detected for some time. When repotting, examine the old pot for the white deposits left by this pest. If it is present, wash off the old soil and to soak the plant in a suitable insecticide before replanting it. 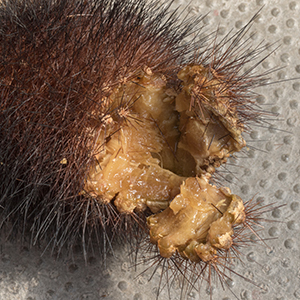 These tiny pests are mites, not true spiders and are barely visible to the naked eye. Their presence can be indicated by the fine webbing they leave on the plants. 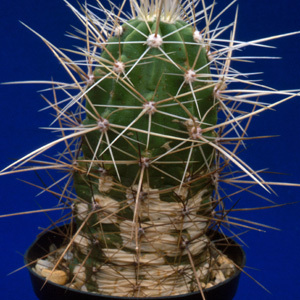 They thrive in the dry atmosphere of cactus greenhouses and cause a brown scarring of plants, often around the growing points of cacti. Thrips are more and more becoming a problem, most especially Western Flower Thrips. They can often be seen moving about on the petals of flowers. They damage and deforme flowers, and are also suspected of causing similar plant body damage to Red Spider Mite. Although unaffected by many chemical, an appropriate systemic insecticide is probably the only control. Usually discovered by the sight of tiny flies circling around infected pots. Although the flies themselves do no harm, their small, semi-transparent worm-like larvae, with black heads are a real danger to young seedlings. They can also attack mature plants. Sciarid flies thrive in composts containing a high proportion of peat, the use of a loam or mineral based compost can deter them. Some insecticides are ineffective, but a soil drench by an appropriate one can be eradicate them. 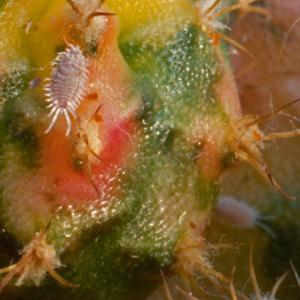 More a nuisance than a serious threat, these small, sap sucking pests clamp themselves onto the bodies of cacti. They exude a sticky substance which can encourage sooty mould. Large cream coloured grubs with brown heads can ocasionally be found in compost. These are the larvae of Vine Weevils which burrow into the body of plants from below the soil level and eat them hollow. Of course there are many other, more general, pests including slugs and snails, aphids and even rodents and pets which must also be watched out for. Diseases tend to be less of a concern than pests, particularly if a good clean 'housekeeping' regime is adopted. Remove and dispose of dead plants or parts of plants, do not allow fallen leaves, or other detritus to accumulate and clean up spillages of compost. Add to this adequate ventilation and air movement and disease should not present a major problem. Plants that suddenly collapses are most likely victims of rot. It is often caused by overwatering leading to root loss, or by a damaged surface becoming infected. If discovered before it is too late it should be possible to save at least part of the plant. Cut out all of the soft, brownish, rot leaving only healthy tissue. Treat the remaining piece as a cutting. If any rot is not removed it will quickly become re-established and kill the rest of the plant. The plant slowly shrinks and dries out, going rubbery. There is often a bright orange-brown or pinkish discoloration of the inner tissues. 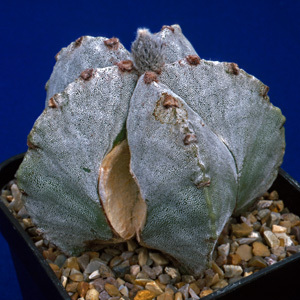 A similar problem occurs with Stapeliads, but in this case it is black in colour. Treat the plant as described for rot (above). 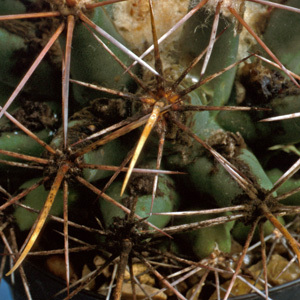 Some cacti, particularly those such as Ferocactus that secrete a sugary substance from their areoles, attract this dark coloured mould. It is unsightly and is not easy to remove. Washing the secretions off the plant during the growing season can help prevent the mould forming. This grey fungal growth can form on plants especially if the collection is subject to cool and/or humid conditions. Otherwise it will usually only form on dead plants or vegetation. Removing dead flowers, seeds, leaves etc. can help prevent botrytis becoming established. Fungicide treatment can help eradicate it. Insecticides & fungicides can kill ! Please feel free to print, copy and distribute these cultivation notes. We do ask however that the BCSS Teesside Branch is acknowledged as their source on any such copies.